These recycled plastic hexagon picnic tables fit in perfectly on outdoor patios, in the middle of forest preserves or outside office buildings. The innovative bench design allows easy slide in access and eliminates the hassle of stepping over the bench to sit down. Constructed with highly durable 100% recycled plastic, these tables are low maintenance, weather resistant, and won't splinter like standard wood tables. 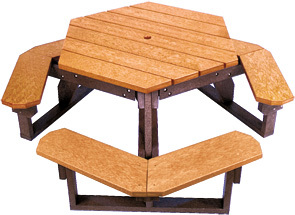 The hexagon table top measures 40"L x 46-3/6" and comes standard with a 2" umbrella hole. The entire table is securely fastened together with all stainless steel hardware. Table top and frame are available in the color options shown below.